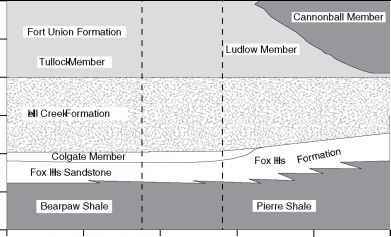 Figure 6.3 Outcrops of the Hell Creek and Fort Union formations near Marmarth in the Williston Basin of southwestern North Dakota. a - view of Bobcat Butte showing badlands of the Hell Creek Formation in the foreground and the lowermost part of the Fort Union Formation at the top of the butte in the distance. 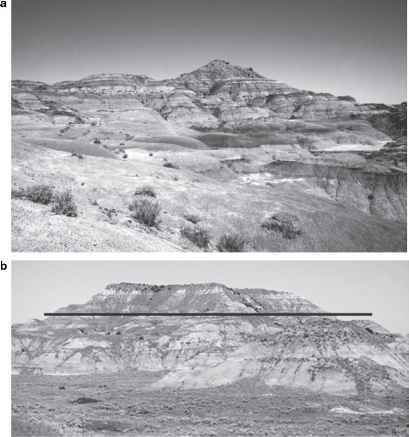 b - view of Pretty Butte, which is composed of both Hell Creek and Fort Union strata; the black line approximates the position of the formation contact and the K-T boundary. replaced the dry-land forests of the Maastrichtian, which largely had been destroyed by the terminal Cretaceous event. There was no recovery of the former species richness in the Williston Basin. 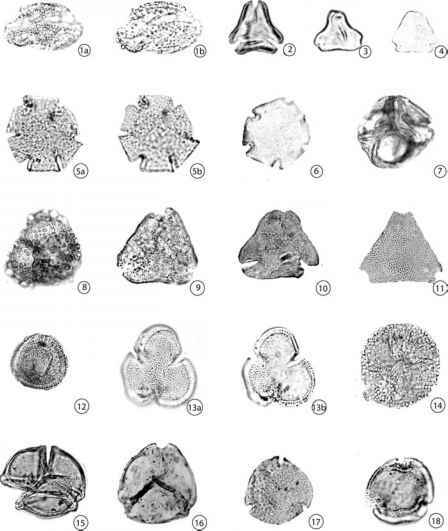 The flora remained relatively static and depauperate for at least the first million years or so of the Paleocene. At first, ferns and peat moss were the most common plants. Later, angiosperms reclaimed dominance, but although palms persisted, most of the species of the low-diversity Paleocene forests were those that had been extremely rare in the region during the Maastrichtian. Toward the end of the Paleocene, forests were composed largely of cupressaceous-taxodiaceous conifers. These swamp-loving trees contributed much to the accumulation of the peat deposits that would eventually form thick coal beds.